Cracked Teeth, bruxism, night guards – Hmm. If you’ve spent any amount of time in Colorado chances are your windshield has at least half a dozen chips and cracks. It’s almost a badge of honor. I am determined to see how far I can push mine before it finally implodes into my eyes in a terrifying hail of glass particulate. It’s quite exciting really. Our teeth are very similar. Our unofficial made up statistics show that 68% of the Boulder population has at least one broken front tooth from a sibling, a ski accident, rock climbing, or squirrel suit incident. But beyond obvious trauma our teeth face a variety of dangers. Bruxism, or tooth clenching/grinding is probably one of the worst. Our teeth are only really meant to touch when we chew or talk. If they are in contact for more than that it can lead to a host of issues including headaches, muscle tension, occlusal traumatism, fractured teeth, ground teeth, etc. These things are all bad. One of the easiest ‘cures’ for this is a night guard, which prevents your teeth from locking together while you sleep. There are many different types of night guards out there, depending on your specific grinding needs. A heavy duty linebacker who is really gnashing their teeth every night might require something that covers every tooth, whereas most people can enjoy an NTI, or neural-trigeminal inhibitor, which snaps onto the front teeth and is much more comfortable to wear. There is also the economical drug store option, although those are often difficult to tolerate. No matter what you opt for it will always be less expensive than replacing a fractured tooth. A chunk of plastic is much easier to repair and replace than your precious enamel. Which brings us to fractured teeth. Cracks are a tricky thing. They can be perfectly harmless, or they can be indicative of a total devastating tooth failure. Cracked teeth need to be carefully evaluated. 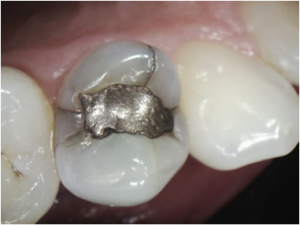 In a case like the one pictured the most conservative approach was to remove the old mercury filling, replace it with a composite core, and cover the tooth with a ceramic crown. The reason being a crown will squeeze the tooth together, while another filling will simply wedge it further apart and allow the crack process to continue. But Dr. Patrician, why not just wait until the tooth breaks to put a crown on it? Excellent question, dear reader! If the tooth snaps off and you are lucky you can crown it. If you are lucky. If it breaks in any other way you end up without a tooth. If a tooth is indeed cracked a crown is unfortunately no guarantee of success. It’s almost like you are gambling to see what will happen. The symptoms of a cracked tooth may not be obvious. They rarely show up on x-rays. Often they will only be spotted during an exam. You may also notice pain when you bite on the afflicted tooth. This is a result of the tooth spreading away from itself, allowing fluid into the pulp. Hopefully a crown will be sufficient to protect the tooth. Sometimes the tooth will need endodontic therapy to remove the nerve. But even then if the crack is going down the root the tooth may be doomed. We often don’t know if that is going to happen until all other methods of treatment have expired. If you do need your tooth out it does not mean the end of the world. We live in a golden age of implantology. A doomed cracked tooth should be removed, with a bone replacement graft placed. Once bone has reinhabited the site an implant can be placed. Stay in a safe padded room away from mountain bikes. But if you must go out and crack a tooth we are here to handle the situation.